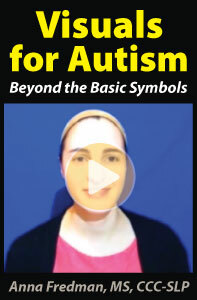 Visuals for Autism: Beyond the Basic Symbols is a 2-hour online video continuing education (CE/CEU) course that demonstrates when, how, and why to use visuals with students with autism. This course has been renewed with ASHA to provide online CEUs for Speech-Language Pathologists (SLPs). It is well-established by research that many learners on the autism spectrum benefit from the use of visuals. How can we go beyond a basic use of symbols to create and implement individualized visuals that will help our students learn and communicate more comprehensively? Participants will learn about considerations and strategies to take into account in order to put more effective visuals in place for their students on the autism spectrum. Topics covered include: broadening symbol selection, adding layers and additional components to visuals in order to make them more motivating and meaningful, providing visuals for a wide variety of expressive communicative functions, and using visuals for comprehension and organization as well as expression. This video course provides instant access to the course video, course handout and CE test. After enrolling, click on My Account and scroll down to My Active Courses. 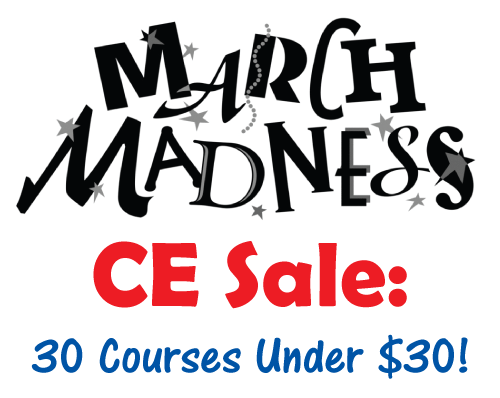 From here you’ll see links to view the video, download/print the course handout and take the CE test (you can print the test to mark your answers on it while watching the course video). Professional Development Resources is a nonprofit educational corporation 501(c)(3) organized in 1992. We are approved by the Continuing Education Board of the American Speech-Language-Hearing Association (ASHAProvider #AAUM) to provide continuing education activities in speech-language pathology and audiology. We are also approved by the Florida Board of Speech-Language Pathology and Audiology (Provider #50-1635) and the Ohio Board of Speech-Language Pathology and Audiology and is CE Broker compliant (all courses are reported within a few days of completion). In the largest national study of children with autism to date, researchers examined one of the most mysterious aspects of autism spectrum disorder: that it sometimes simply vanishes. An estimated 1 in 68 children have been diagnosed with autism spectrum disorder in the U.S., but researchers are beginning to take note of a small minority of children with ASD who seem to “grow out” of their diagnoses. The Centers for Disease Control and Prevention surveyed more than 1,400 children with ASD — the largest nationally representative sample of children with autism to date — and found that about 13 percent of them seemed to shed their ASD-associated behaviors as they grew up. The catch: that doesn’t mean they’ve stumbled upon some kind of miracle therapy or cure. Rather, as some previous researchers theorized, most of them were simply misdiagnosed or intentionally diagnosed with ASD for other reasons. “The present study confirms that ASD diagnoses can and sometimes do change as children mature and overcome delays, and as new information is assimilated by their healthcare providers,” said Stephen Blumberg, lead author and an associate director for science at the CDC’s National Center for Health Statistics. 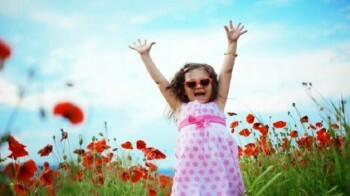 Partnering with the University of Washington and the U.S. National Institutes of Health, the CDC identified five factors that were most common among the children who went on to “outgrow” their diagnosis; these signs make it clear this subgroup was already higher functioning and had fewer symptoms at diagnosis. Children who were less likely to be referred to a specialist. The study adds to a body of research on “lost” diagnoses that already suggests children most likely to outgrow ASD diagnoses are those with high IQs (over 70), early communication skills and intensive therapy. And children with certain sub-types of ASD, like Asperger’s Syndrome and PDD-NOS, are also more likely to lose their diagnosis. Among parents whose child lost an ASD diagnosis, 73.5 percent said it was because they were given a new one, such as attention deficit hyperactivity disorder (46 percent), anxiety problems (17 percent), depression (12 percent) learning disabilities (seven percent), behavioral problems (nine percent) or sensory, auditory, or processing disorders (23 percent). Another 24 percent said they used the ASD diagnosis to access benefits and services. Meanwhile, 21 percent of parents believe their kids matured out of the disorder or received effective treatment. Less than 2 percent of patients believed their doctor simply got the diagnosis wrong. The study can’t prove that overdiagnosis is becoming more common, the researchers wrote. However, heightened awareness about ASD and a push for more screening measures could be resulting in early, inaccurate diagnoses for ASD among doctors — especially in those who don’t specialize in the disorder. The research was published in the journal Autism. Apps for Autism is a 3-hour CEU course that guides you through the hundreds of apps for autism so you can utilize today’s technology to maximize your child or student’s success. Autism Movement Therapy is a 2-hour video continuing education (CE/CEU) course that teaches professionals how to combine movement and music with positive behavior support strategies to assist individuals with Autism Spectrum Disorder (ASD). Autism: The New Spectrum of Diagnostics, Treatment & Nutrition is a 4-hour online continuing education (CE/CEU) course that describes DSM-5 diagnostic changes, assessment, intervention models, dietary modifications, nutrition considerations and other theoretical interventions. Autism Spectrum Disorder: Evidence-Based Screening and Assessment is a 3-hour online CEU course that identifies DSM-5 diagnostic changes in the ASD diagnostic criteria, summarizes the empirically-based screening and assessment methodology in ASD and describes a comprehensive developmental approach for assessing students with ASD. Professional Development Resources is approved to offer online continuing education (CE/CEU) courses by the American Psychological Association (APA); the National Board of Certified Counselors (NBCC); the Association of Social Work Boards (ASWB); the American Occupational Therapy Association (AOTA); the American Speech-Language-Hearing Association (ASHA); the Commission on Dietetic Registration (CDR); the Alabama State Board of Occupational Therapy; the Florida Boards of Social Work, Mental Health Counseling and Marriage and Family Therapy, Psychology & School Psychology, Dietetics & Nutrition, Speech-Language Pathology and Audiology, and Occupational Therapy Practice; the Ohio Counselor, Social Worker & MFT Board and Board of Speech-Language Pathology and Audiology; the South Carolina Board of Professional Counselors & MFTs; and by the Texas Board of Examiners of Marriage & Family Therapists and State Board of Social Worker Examiners. The eighth annual World Autism Awareness Day is April 2, 2015. Every year, autism organizations around the world celebrate the day with unique fundraising and awareness-raising events. How will you celebrate? 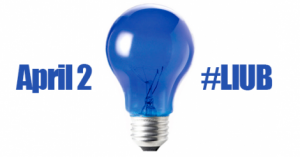 Use #LIUB to share your experience across social media and help light the world up blue this April! Find out which major global landmarks will light up blue in 2015. 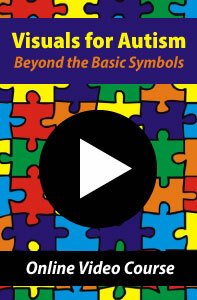 Visuals for Autism: Beyond the Basic Symbols is a 2-hour online video continuing education (CE/CEU) course that demonstrates how the use of symbols to create and implement individualized visuals will help our students learn and communicate more comprehensively. This online video streaming course provides instant access to the course video, course handout and CE test. Successful completion of the online CE test (80% required to pass, 3 chances to take) and course evaluation are required to earn a certificate of completion. You can print the test (download test from My Courses tab of your account) and mark your answers on while viewing the video. Then submit online when ready to receive credit. Email any questions to admin@pdresources.org – we’re here to help!